Home programs allow what has been learned during treatment to be carried over in the home. With summer upon us, there is plenty of time to try some new activities. Of course, we want you to relax and enjoy your child too, but consider the home program an extension of what you and your child are learning here in the clinic. siblings can be part of the home program, it’s a great way to get them involved in therapy. it allows goals to be met at a faster pace than therapy alone. engaging in a home program makes OT treatment more effective overall, you are your child’s best teacher. because you know what’s going on in therapy, you can continue even after your child may be discharged from OT. if your child is sick or has to be absent from OT, you can continue with some activities. Whether or not your currently have a home program, your OT would be happy to discuss this with you. We can even send video or photos of your child in therapy so you know exactly what to do. That being said, we also know that everyone needs some downtime and there are weeks that some things just don’t get done. We’ve all been there! 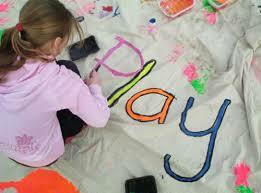 We hope you have a great summer and continue being an active part of your child’s therapy! Post this in your kitchen! 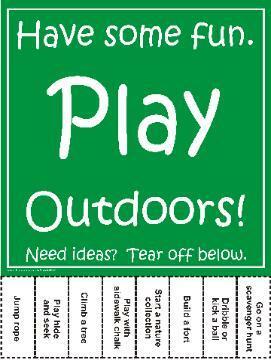 Use this tear off sheet to encourage your kids to play outside as much as possible this summer. Use your imagination! Make your own, have your kids earn credit for each one they tear off and do…Here is the link from Therapy Source.